Visit our project page on Fritzing, download the schematics and the code to program your favorite Arduino; then choose a good watermelon and stick tight the sensor to it, after that connect it to your computer via USB, start the game (Showcase Version), select the port where Arduino is connected and play. Let's just say I now support the pro-watermelon movement. Very nice short, I played it as part of my Melon Jam highlighting! Most of the commenters are high or something? The game has interesting concept of course, and is pretty polished. This was way too much fun, fun to play, fun to edit. Great game short and sweet! 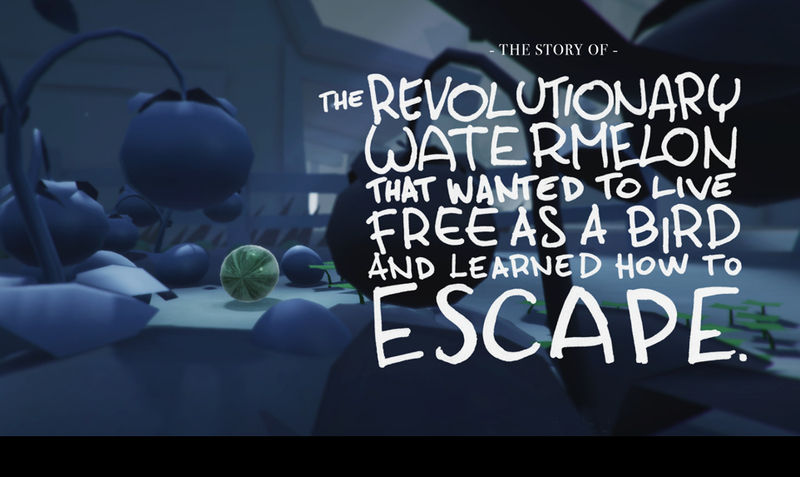 The Story of the Revolutionary Watermelon is a game with two things: A.) A crazy long title for a game and B.) Is an interesting short indie game that is pretty interesting. The story is simply that you play as a self-aware watermelon that is trying to run for freedom. The only mechanic that you can use in the game is a jump feature and you have to use physics and the environment to trek through the level. The atmosphere and sounds of the game are so well done, making for a pretty ominous soundtrack. The art direction and style look very nice and remind me a lot of games like "Inside." Some negatives are that the jump feature doesn't always work, forcing you to spam the button, which then results in death since you can only sustain a certain amount of damage. The game is also surprisingly short and you can breeze through it in less than 3 minutes if everything goes right (side note: this was made for a gamejam, so we can forgive the length of the game for that reason). Overall though, The Revolutionary Watermelon was an enjoyable game that I think can be fleshed out even further and made into a full-scale experience! I made a Let's Play of the game so I hope you can check it out and thank you to the developer on making a fun game! Why did the watermelon cross the road? Because it wanted to live free as a bird... Not a conventional punchline, I'll give you that. Hello, we have made a test of this game. That's great, thanks for your video! Unfortunately we don't understand anything in French....But who cares: it sounds good, that's enough! Note to the viewer: I was probably overly critical of a game made in a few hours. The game is unique for what it is, but there could be a LOT more added to the game for a better story. Don't take my let's play to heart, SpaceBackyard. You did a lot more than I could ever do making a game like this and to that, I give this game a thumbs up.